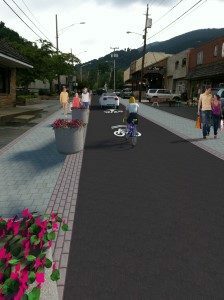 DAVENPORT is currently providing transportation engineering and design services for this project which includes enhancements to Howard Street in downtown Boone. 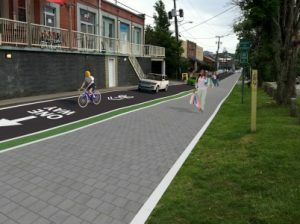 Initially, DAVENPORT as retained to conduct a feasibility study to provide the Town with recommendations for their planned conversion of Howard Street to one-way vehicular travel. Given its location downtown and proximity to Appalachian State University, Howard Street experiences heavy pedestrian traffic. However, it lacks the pedestrian-friendly features that would make it safer and more efficient for all area patrons. Currently, there is a pedestrian path comprising one travel lane on Howard Street from Water Street to Depot Street. The pavement condition in this area is poor and uneven in the pedestrian and vehicular lanes, both of which are used by pedestrians and bicyclists. A shortage of crosswalks, numerous parking lot access points and vehicular parking in the pedestrian lane for loading and unloading all create conflict points between pedestrians and vehicles. By converting Howard Street to one-way travel, the Town hopes to improve safety and better accommodate all traffic. Specifically, the Town plans to incorporate elements associated with a woonerf, or shared space, concept that gives equal consideration to pedestrians, bicyclists and cars. A typical Woonerf design eliminates curbs and instead uses bollards or trees to designate space to pedestrians and textured or alternate paving material to clearly mark the entrance to an area where motorists are restricted. As part of the feasibility study, DAVENPORT analyzed two one-way conversion scenarios for Howard Street. both eastbound and westbound,and ultimately recommended the westbound option because it provided better traffic circulation and fewer conflict points. DAVENPORT also recommended providing high visibility crosswalks, sharrows, consolidating/eliminating/narrowing existing driveways along Howard Street, short term parking for loading, enhanced lighting, and traffic signal modification. Having worked in the project area previously, DAVENPORT understood the Town’s goals and concerns, as well as travel patterns, planned development and projected growth that would contribute to the feasibility of the recommended improvements. The firm also participated in a public meeting to educate stakeholders about the study and proposed improvements. Ultimately, DAVENPORT’s recommendations addressed the Town’s needs for accommodating vehicular traffic, facilitating safe and efficient traffic flow, minimizing conflict points, while providing for the much needed pedestrian improvements along Howard Street to meet the Town’s goals and vision for the corridor. DAVENPORT was subsequently awarded a contract to provide full design documents for the recommended improvements.